Where were the Gadarene Swine? The Gadarene Swine slaughter took place in the countryside around Gadara. This was one of the semi-autonomous Ten Cities (the Decapolis), in the Roman-controlled area mostly east of the River Jordan. Gadara was almost certainly at the place now called Umm Qais. In the panorama we have Umm Qais in the foreground, the Sea of Galilee in the background, and the Golan Heights on the right. The gospels say that the pigs rushed over the cliff into the sea and were killed. It is not possible today to find a location on the east of the Sea of Galilee where such a fall is possible – there is a margin of flat land between the Sea and the Golan Heights, and the heights of Umm Qais are even further away. One possibility is that the lake level may have been higher. 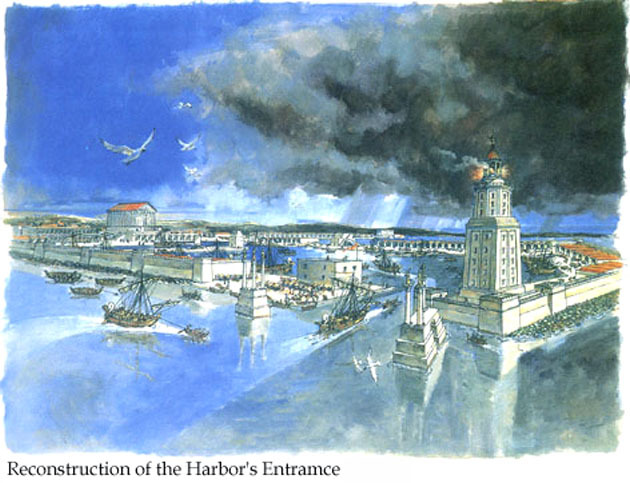 But more likely the lake that the pigs fell into wasn’t the Sea of Galilee, but some other lake in the area. The southern end of the Golan Heights is near vertical in places – you can see the road switchbacking down in the photo. Driving down it you will pass wrecked vehicles suspended halfway in the vertical ravines beside you. And at the bottom is a small lake. The oddest story in the Gospels is surely the one about the Gadarene Swine. It is so odd that many Christians don’t know it, and of those who do, many think is a parable. But it isn’t. Slightly different versions of the story (of course) are found in Matthew 8, Mark 5, and Luke 8. Jesus is in the countryside going toward Gadara (east of the River Jordan). A madman comes out of some tombs. He says his name is Legion, because he has many devils in him. Jesus commands the devils to leave him. The devils ask to go into some other being, so as not to go back to the abyss of hell. Jesus kindly sends them into a nearby herd of pigs. 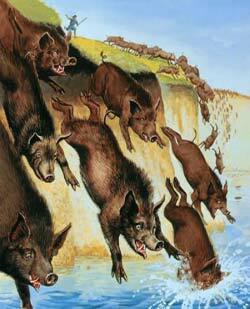 The 2,000 pigs rush over a cliff into the sea and are killed while the swineherds run away. The madman is cured. Jesus and whoever was with him carry on to Gadara. People come from Gadara, upset with Jesus, and tell him he isn’t welcome there. Jesus goes somewhere else, telling the healed man to talk about what he has seen. So who would have owned 2,000 pigs? A Jew? No. A non-Jewish farmer, maybe a Greek immigrant with a cow and an acre of land? Of course not. Or is the answer in the madman’s name, Legion? It’s a part of the Roman Legion’s food supply, then. In “The Gospel According to the Romans” this event is a strike by Jesus against the Romans occupying the Holy Land. A Zealot action against our friends the Legio X Fretensis. I can’t think of a more plausible interpretation. And we have a deliberately garbled version of the story in the gospels, because the story was too well-known to be ignored. Paul’s pro-Roman revisionism did its best to disguise it. So forget “Jesus meek and mild”. You may have seen pictures of Jesus tenderly holding a little lamb, but have you ever seen him cuddling a piglet?